This hotel is 1.5 miles from downtown White River Junction, Vermont and the New England Transportation Museum. It features a daily breakfast buffet and spacious rooms with free Wi-Fi. At A Glance history and outdoor fun on a budget. 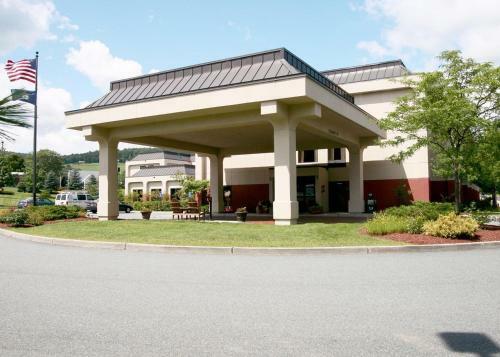 Welcome to the Hampton Inn White River Junction hotel located in the bustling town of White River Junction. Stroll through the historic downtown and sample the shops, restaurants and galleries. Explore the great outdoors in the mountains of Killington, Ascutney and Sunapee. Dartmouth College is a ten-minute drive away from our White River Junction, VT hotel. Discover a host of thoughtful services at our hotel in White River Junction. Start your day with Hampton's free hot breakfast® every morning or grab a Hampton On the Run® Breakfast Bag to go from Monday through Friday. Stay in touch with family, friends and the office with free internet access throughout the hotel. With a fitness center and indoor swimming pool, our Hampton Inn White River Junction hotel makes it easy to keep fit on the road. The business center is always open for any business needs. From board meetings to cocktail parties, our hotel is ideal for an intimate business meeting or social event. Retreat to a comfy guest room and get an excellent night's sleep in the clean and fresh Hampton bed®. Which guidebook or travel blog do you like to use?